Captain Nathaniel Clock helms MISCHIEF, with her unusual vertical wheel, down New York Harbor toward the start of the first race of the 1881 America’s Cup defense. The tug EDWARD LUCKENBACK, serving as the New York Yacht Club committee boat, follows close astern, while the steamer CYGNUS and Canadian challenger ATALANTA fall behind. 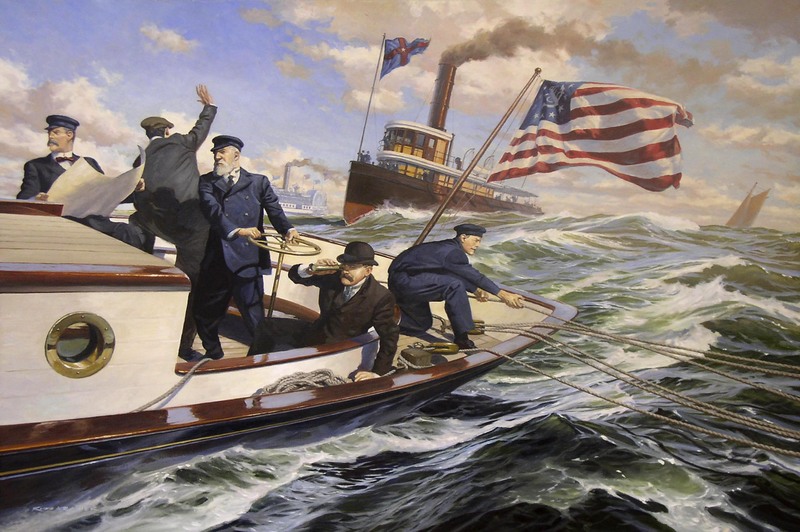 The series was planned as a “best of three” with Atalanta pitted against Mischief (designer: Archibald Cary Smith, 1837-1911, built by Harlan & Hollingsworth of Wilmington, Delaware in 1879 for English owner Joseph Richard Busk of the New York Yacht Club.) Mischief was 3′ shorter LOA and LWL, 1′ greater in beam, displaced about the same, maybe marginally less, carried 250 sq ft more sail area – rigged with an extra 7′ of topmast with a slightly shorter boom (10″) and slightly longer bowsprit (1′ 8″.) Nicknamed “The Iron Pot”, she was skippered by Nathanael “Than” Clock during the series. She was arrested for smuggling in 1904, and was finally taken out to sea and scuttled in 1929. 9 November, 1st race, 32.6 miles, “inside course” (triangle), fresh Sou’Wester: Atalanta started reefed, added then struck tops’l, shook out reef, added then struck tops’l; Mischief started with a full main then shortly added her tops’l; both boats set and struck a balloon jib top on the downwind leg. 10 November, 2nd race, 32 miles, “outside course” (leeward windward): Atalanta did fairly well downwind, losing only 2 min 15 secs at the leeward mark. As to sail changes Atalanta started with her tops’l and reefed main, Mischief with a working tops’l and full main; both set a balloon jib tops’l, but Atalanta broke her pole; both housed their topmasts for the return leg, Atalanta double reefed, Mischief single reefed.